It runs the analysis for a loop on demand. This can be initiated by querying the loop access info via LAA::getInfo. 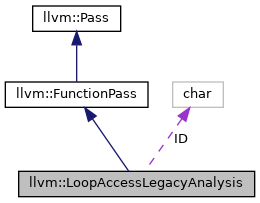 getInfo return a LoopAccessInfo object. See this class for the specifics of what information is provided. Definition at line 717 of file LoopAccessAnalysis.h. Definition at line 721 of file LoopAccessAnalysis.h. References F(), llvm::PassRegistry::getPassRegistry(), llvm::initializeLoopAccessLegacyAnalysisPass(), and runOnFunction(). Definition at line 2365 of file LoopAccessAnalysis.cpp. References llvm::AnalysisUsage::addRequired(), ID, and llvm::AnalysisUsage::setPreservesAll(). If there is no cached result available run the analysis. Definition at line 2334 of file LoopAccessAnalysis.cpp. Definition at line 2343 of file LoopAccessAnalysis.cpp. References llvm::depth_first(), getInfo(), llvm::raw_ostream::indent(), and llvm::LoopAccessInfo::print(). Definition at line 734 of file LoopAccessAnalysis.h. Definition at line 2354 of file LoopAccessAnalysis.cpp. Definition at line 719 of file LoopAccessAnalysis.h.